My 9 year old setter has cataracts. I've been looking into treatments and unfortunately surgery, even if it was an option is financially not feasible for me. I have read about oral medicine and eye drops, but the skeptic in me wonders if those are really snake oil or if they actually help. Anyone have experience with these types of remedies and if so did they help? In the day my setter seems to see just fine outside, but in transitioning light and dim rooms she is having difficulty. I've read that some topicals/drops can cause damage to the eyes which would eliminate the option of surgical removal of cataracts at a later date, while not doing anything to dissolve the cataracts. IIRC some topicals can cause uveitis. the costs are similar or less than the local vet. There were some studies a few years ago, the specialists would know the results. Until this summer I worked in the veterinary ophthalmology field for 9 years, selling Phaco Machines (for removing cataracts) and the intraocular lenses that they put in to replace the lenses that they remove during cataract surgery. Your skepticism is correct, once a dog has cataracts the only option currently available to remove them is surgery, anything else that is advertised for cataracts removal is snake oil. I did work with a doctor that developed a product called Ocu-Glo, it won’t remove the cataracts but it may slow down their development and is very beneficial for the eye. It is the only thing that I ever saw that was really worth it and a lot of ophthalmologists are now giving it to their patients. Interesting side note though, your info says you live in Green Bay, two of the pioneers of veterinary ophthalmology live just south of town, Sam Vainisi and Gretchen Schmidt. They’re great people and they may still be seeing some patients on a limited basis. I did order Ocu-Glo today. 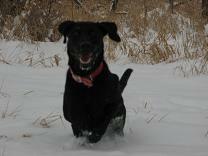 I plan on talking with my vet when I pick up the paw print from my 14 yr old lab that I just put down.